This stunning home in Barton Creek was custom built by Greg Hurd with Sereno Homes. With great attention to detail throughout the home, the expansive floor plan offers 4 bedrooms and 4 full and 2 half baths. The spacious 1st-floor master suite has a fireplace and sitting area. 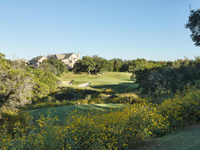 The large private lot boasts a pool, outdoor dining space and a fire pit that overlooks the golf course and Hill Country. Experience luxury living in this beautiful, peaceful setting at 8210 Chalk Knoll.